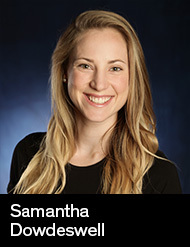 After graduating from Monash University in Melbourne with a Bachelorʼs degree in Performing Arts, Samantha moved to New York City to study acting at the American Academy of Dramatic Arts. It was there that she was introduced to the wonderful world of voice and speech and all the possibilities it affords an actor. Soon after returning home to Australia, she applied for the Master of Fine Arts (Voice) course at NIDA, with the intent to pursue voice teaching after graduation. It proved to be a demanding, yet incredibly rewarding journey. Her approach to voice is influenced by her background in physical theatre and clowning. She has begun to adapt games and exercises from both performance fields to free the actor both physically and vocally from habitual patterns. She believes integration of body, breath and voice is crucial to every performance and although her pedagogical philosophy is not yet solidified, she believes these three elements will be of strong focus.